Place the eggs into a saucepan in a single layer and fill with water to cover the eggs by 1 inch. Cover the saucepan and bring the water to a boil over high heat. Remove from the heat and let the eggs stand in the hot water for 15 minutes. Drain. Cool the eggs under cold running water. Peel once cold. Halve the eggs lengthwise and scoop the yolks into a bowl. Gently mash the yolks with a fork. Melt butter in a skillet over medium heat; cook and stir the shrimp, green onion, and garlic powder in the melted butter until, about 4 minutes. Transfer the shrimp to a cutting board and mince. Stir 3/4 cup of the minced shrimp and any remaining liquid from the skillet into the egg yolks; reserve remaining shrimp for garnish. Add the mayonnaise, mustard, pickle relish, and hot sauce; mix well. Scoop the mixture into a resealable plastic bag, seal the bag, and snip a corner off the bag with scissors to make a piping bag. Gently squeeze about 1 1/2 tablespoon of filling into each egg white half. Garnish each deviled egg with a few pieces of the reserved chopped shrimp and a pinch of the chopped parsley; chill for at least 30 minutes in refrigerator before serving. These were delicious and make such a pretty presentation. I topped each one with a whole tiny shrimp and a small parsley leaf. Even better the next day! Surprisingly good! I used dill pickles instead of sweet. Will make this again. i basically just used the old fashioned recipe and added shrimp. great idea very delicious and simple. 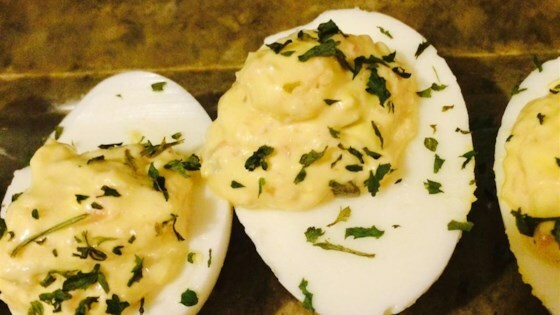 The BEST deviled egg recipe I've ever made, bar none! I made 18 of these for a small gathering of 10 people, and they were gone in less than 15 minutes. Thanks so much, Geritzla!